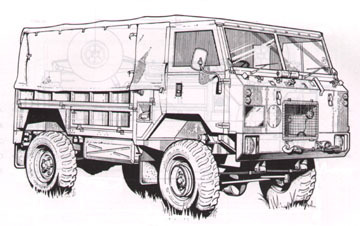 The 101 Forward Control LandRover was built for the British Military from 1975 to 1978 with a number of preproduction models dating from 1972-1974. Roughly 2700 vehicles were manufactured in right and left hand drive, 12 and 24V models. The majority of vehicles were GS models (General Service) and are "softops". 3 types of hard body 101's were also produced on stripped GS chassises. These include an Ambulance (Approx. 300-450, body by Marshal's of Cambridge), a Radio Body (Approx. 125), and the "Vampire" Radio Body (Approx. 9-18, body by Marshal's of Cambridge). There may be fourth type of hardbody, a Power Generation Vehicle, but since only one is confimered to exist I not sure it can be classified as a manufactured "type."